I first met Dustin Angelo, CEO, at the Metals Investor Forum in Fall 2016 at the Playfair Mining booth. 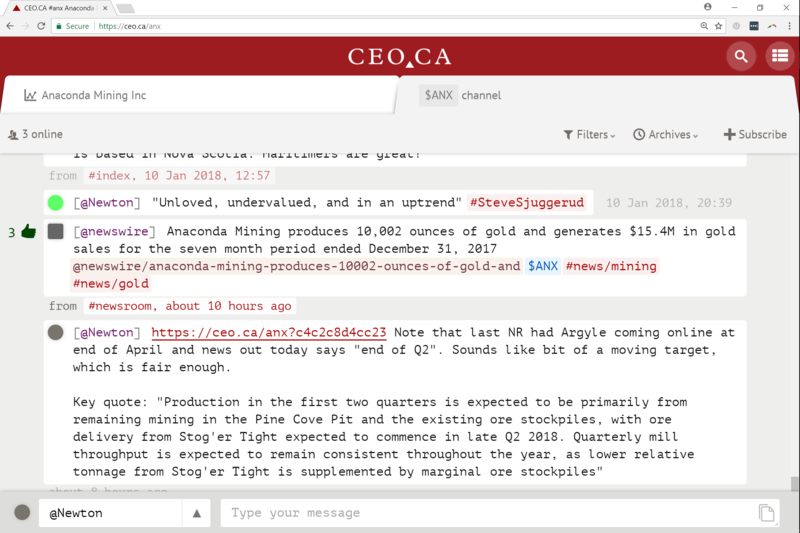 Dustin and I had a nice little chat that I published in full here (https://ceo.ca/@newton/6500-words-with-dustin-angelo-ceo-of-anaconda-mining). Right from the start, I thought that Anaconda was something special and I wrote this companion piece along with the first interview (https://ceo.ca/@newton/rage-against-the-dying-of-the-light-anaconda-mining). A few months later, I attempted to explain some important aspects of the financials for Anaconda in this short piece (https://ceo.ca/@newton/how-exploration-spending-by-anaconda-mining-anx-affects-costs) I appreciated Dustin's ability to clearly describe how the plumbing of the company's accounting reflects different aspects of their corporate strategy, which was all about optimizing existing assets, and tried to explain it in my own words. We had another interview in Q1-2017 and it almost seemed that we had run out of things to talk about (https://ceo.ca/@newton/checking-in-with-dustin-angelo-anaconda-mining-anx) but that was quickly changed by news soon after of Anaconda's first acquisition! I wrote 3 articles about the combination of Anaconda Mining and Orex Exploration (https://ceo.ca/@newton/first-impressions-on-anaconda-anx-acquisition-of-orex-ox and https://ceo.ca/@newton/checking-for-a-premium-in-proposed-acquisition-of-orex-ox-by-anaconda-anx and https://ceo.ca/@newton/synergies-betwen-orex-ox-and-anaconoda-anx) I was pleased with what I saw, but I knew was missing something -- I just didn't know what. Following that it was time for another interview with Dustin (https://ceo.ca/@newton/60-minutes-with-dustin-angelo-ceo-anaconda-mining-anx) and then things started to get really interesting with the help of Mr. Kevin Dougan. My interview Mr. Allan Cramm (https://ceo.ca/@newton/2-hours-with-mr-allan-cramm-vp-innovation-development-anaconda-mining-anx) really helped me understand why I felt that Anaconda had the spirit of a major producer from the first time I met them. They have built something special with a group of young miners in Baie Verte, Newfoundland, and that is inspiring. Next, interviews with newly-appointed CFO Mr. Robert Dufour helped show me that Anaconda has what it takes to be successful on Bay Street. (https://ceo.ca/@newton/brief-discussion-of-anaconda-mining-anx-financials-with-mr-robert-dufour and https://ceo.ca/@newton/interview-with-mr-robert-dufour-cfo-of-anx-anaconda-mining). And then we come to Goldboro. First, an interview with Mr. Jonathan Fitzgerald (https://ceo.ca/@newton/60-minutes-with-jonathan-fitzgerald-chairman-anaconda-mining-anx) helped me understand what was going on at Orex leading up to the deal with Anaconda. I was impressed to hear about the process that led him to Orex in the first place, which started to let me know that there was something special to Goldboro. My first interviews were simple enough (https://ceo.ca/@newton/first-interview-with-the-unknown-geologist and https://ceo.ca/@newton/second-interview-with-the-unknown-geologist). Then, things got interesting when we introduced Mr. Bob Moriarty to the story (https://ceo.ca/@newton/the-unknown-geologist-introduces-bob-moriarty-to-the-goldoboro-project-anx and https://ceo.ca/@Newton/more-from-the-unknown-geologist-bob-moriarty-on-anx-goldoboro-project). Finally, I had my own little conversation with Dave in the first week of 2018 and prepared 3 articles documenting our discussion (https://ceo.ca/@Newton/finding-the-ore-shoots-with-the-unknown-geologist-at-anaconda-mining-anx-goldboro-project and https://ceo.ca/@Newton/geometry-of-ore-shoots-at-anaconda-mining-anx-goldboro-project-unknown-geologist and https://ceo.ca/@Newton/stories-from-goldboro-anx-with-the-unknown-geologist). Note that this third article isn't officially published yet, although you can read it in full at the link. A little something for those of you who stuck with me this far. And, just for fun, I used Anaconda as a test case for a mathematical model that I created called the "NPV Profile". It's a simple twist on the basic definition of Net Present Value and it proved useful in understanding what kind of upside Goldboro could offer Anaconda in a hypothetical scenario (https://mpra.ub.uni-muenchen.de/81353/1/MPRA_paper_81353.pdf and https://mpra.ub.uni-muenchen.de/79764/1/MPRA_paper_79764.pdf and https://mpra.ub.uni-muenchen.de/81197/2/MPRA_paper_81197.pdf). I even tried writing something en francais to help the Orex audience understand just what may be taking shape at Anaconda here (https://ceo.ca/@newton/comment-goldboro-influence-la-van-pour-anaconda-anx). One of my latest publications is an editorial that tries to tie everything together (https://ceo.ca/@Newton/revisiting-anaconda-mining-anx-first-five-holes-from-goldboro). It's hard to nail everything down since continue to shift, but it's clear that the basic building blocks are in place for an epic speculation.